I’m sure you remember the film Ghostbusters. As a kid this was one of my favourite films, and probably still is. Everyday guys running around the city catching ghosts with unlicensed nuclear accelerators strapped to their backs, saving the world, and generally doing everything a boy dreams of. What more could you ask for? One of the immortal lines from the movie made me draw comparisons to some current mainstream fitness methodologies. Spengler: Don’t cross the streams. Venkman: I’m fuzzy on the whole good/bad thing. What do you mean, “bad”? Venkman: Right. That’s bad. Okay. All right. Important safety tip. Thanks, Egon. I know what you’re thinking. What’s the link between Ghostbusters and building muscle? Surely they’re the most unrelated subjects on the face of the Earth? Bear with me. All will become clear. Pick up any fitness magazine in your local newsagent, or browse the latest articles on popular fitness website and you will find a standard approach to rep ranges that, on face value sounds logical, but in reality, scientific studies shows there is a better way. The popularised view is that you need to work in the 1-6 rep range for strength, 6-12 for hypertrophy (muscle development), and 12-15 when you’re dieting or aiming to increase endurance. I think of these rep ranges as the ‘streams’ of the Ghostbusters’ proton packs. We’re told not to cross these ‘streams’ as low reps are for powerlifters, medium-high reps are for bodybuilders, and high reps are for girls and pre-contest training. In this article I’m going to show you that you should cross the streams, and you will see more muscle growth than ever before as a result. I will guide you through the scientific theory and explanation of the right rep range you need to achieve your goals. Whether you are seeking to increase lean muscle mass or reduce body fat, the science behind rep ranges is clear and it defies the current popularised misconceptions. By the end of the article you’ll have all the information you need and you’ll be hitting the gym tomorrow, safe in the knowledge that you’re on the right path to be the best you can be. So, let’s start with muscle development. What it is and how it works. In true L’Oreal fashion, “here comes the science part”. The study of the human body is extensive and you can delve into the detail of the Perimysium, Epimysium, Endomysium, Fascicles, and other such cells and fibres that make up your muscles. However, I’m sure you don’t want to spend the next few hours of your life, feeling like you’re back at school, reading about the biology of muscles. So I will keep this as concise as possible and cover the key facts, so you can make meaningful changes to your training regime, starting TODAY. Firstly, let’s talk about muscle fibres. There are two broad categories of muscle fibres, Type I and Type II (there are some variations in between, but we won’t get bogged down in that now). Type I fibres are more commonly known as ‘slow-twitch’. These fibres are more resistant to fatigue. Training of these types of muscle fibres are associated with endurance athletes, such as marathon runners and cyclists. Type II fibres are the opposite of Type I and are more often referred to as ‘fast-twitch’. In contrast to slow-twitch, these muscle fibres contract faster, giving them characteristics of strength and power. Type II fibres are only effective in short intervals as they fatigue faster. In the sporting world they are commonly associated with sprinters and athletes requiring shorter bursts of power, speed, and force. Take a look at this picture. It clearly shows the visual difference between someone who has trained for endurance versus someone that has trained for strength and power. Needless to say, even with this basic information, I’m sure you can already tell which muscle fibres you should be focussing on to build that lean, muscular physique you’ve been dreaming of. Am I right? Ok. Now we’ve established that you need to focus training on Type II muscle fibres, the next question we have to answer is HOW? The process of muscle development is called hypertrophy. Muscle hypertrophy is the subject of continual debate amongst biologists and industry professionals and there are countless articles and studies you could read for days on end that will merely cover 5% of the topic’s complexity. Thankfully, you don’t need to be a scientific expert to know the basics and have enough knowledge to get the most out of your training. The important point to remember is that there are two types of muscle hypertrophy, Myofibrillar and Sarcoplasmic. This diagram shows the difference between the two types of hypertrophy. Sarcoplasmic hypertrophy increases the volume of the fluid elements of the muscle. This can be in the form on glycogen, water, and minerals etc. Myofibrillar hypertrophy increases the size and number of muscle fibres, made up of proteins that can contract. In terms of lean muscle development you can clearly see that Myofibrillar hypertrophy is really the goal to maximise your gains in the gym. As a natural athlete, Myofibrillar hypertrophy allows you to develop thicker, stronger, denser muscles. Muscle Damage: Not as bad as it sounds (honest). Training your muscles with resistance based exercises causes high levels of tension. It’s this tension that creates micro tears in the muscle fibres. With the proper rest and nutrition the tears are repaired, leading to muscular development. Cellular Fatigue: Think of cellular fatigue as pushing your muscles to the limits of their endurance. This occurs through high repetition of exercises on a given muscle group. Each one of the methods can be focused on by structuring your training in different ways. For now, I’m going to assume that you are predominantly interested in lean muscle development, as this is the thrust of this article. Studies show that tension overload and muscle damage are the most effective methods of building muscle. Therefore, to achieve your goals it’s important that you select the right approach to emphasise tension overload and muscle damage. So what is the right rep range? As the name suggests, Cellular Fatigue is about tiring the muscle out through repeated activity. In the fitness and bodybuilding world, this type of muscle growth is stimulated by high rep, low intensity training, typically in the 10+ rep ranges. This is in the slap bang in the middle of the rep range that you’ll find in most training plans. It does have its place (which I will come on to later), but it should absolutely not be the primary approach to your training. I predominantly associate this rep range with the gym ‘pump’ that many people crave (misguidedly). The ideal rep range to work in is 4-6. This study shows the effect of low–moderate volume, high intensity training vs traditional high volume, lower intensity training. Importantly, the study was carried out on trained athletes. This is an important point as studies in untrained athletes indicate that strength increases are negligible between the different approaches. However, this has been proven to be as a result of neurological adaptations to a new exercise regimen, as opposed to muscle hypertrophy caused as a result of a weight training programme. The results were clear. The group working in the lower rep range increased both strength and muscle significantly compared to the higher rep range group. This was determined to be as a result of higher amounts of mechanical stress (as opposed to the metabolic stress of the higher rep range group) of training with heavier weights. Additionally, training with heavier weights stimulated more of the participants Type II muscle fibres, leading to greater adaptation and muscle growth. At the end of the article, I have listed some links to further studies that support the low rep theory. 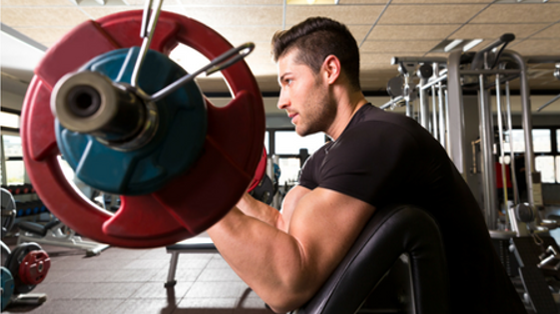 I mentioned previously, that the 10+ rep range does have a place in your training routine. I would recommend incorporating one isolation exercise at the end of your workout within this rep range to stimulate cellular fatigue and Sarcoplasmic hypertrophy. However, you should only do this after training for 18 months to 2 years on a programme solely based on compound exercises and the 4-6 rep range. This will give you a solid foundation of muscle development to build on and refine with the additional approach. The bottom line on rep ranges is to train with compound exercises in the 4-6 rep range to stimulate more Type II muscle fibres, create maximum tension overload and muscle damage, and achieve Myrofibrillar hypertrophy. This will deliver you the greatest lean muscle development in the shortest possible time. This rep range crosses over the traditional ‘streams’ and allows natural athletes to train for strength and muscle growth at the same time. So now is the time to break with convention. Disregard the rules and myths. Think of traditional conventions as the Stay Puft Marshmallow Man, start crossing the streams, and kill that sumbitch!